MOSCOW, Russia -- Where U.S. President Barack Obama and German Chancellor Angela Merkel have failed to make Russian President Vladimir Putin acknowledge his ever-more-overt invasion of Ukraine and think about pulling back, Valentina Melnikova, the head of Russia’s famous Soldiers’ Mothers Committee, might just have a chance. 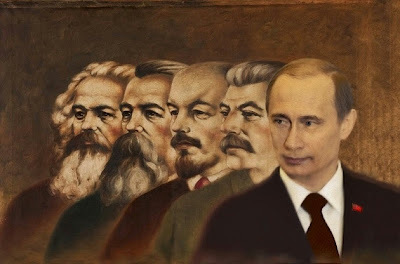 Putin is shown in good company with the Communist architects of the Evil Empire. Early Thursday morning, Melnikova started getting phone calls from Russian army bosses. All of them, from the deputy defense minister to the paratrooper division commanders, wanted to meet with the great matriarch of the Russian military. She had accused the entire high command, along with Commander-in-Chief Vladimir Putin of invading Ukraine and of committing a crime against Russian citizens by sending Russian soldiers to "the bloody battlefields" without declaring the war, without signing legal papers with the servicemen, without letting Russian mothers know where exactly their drafted sons ended up dying. The day before, Russian servicemen were fighting shoulder to shoulder with pro-Russian separatists in Novoazovsk, a strategic port city on the Russian border. By taking over Novoazovsk, the separatists cleared the way for more servicemen to pour into Ukraine. “According to our expert analyses,” said Melnikova – and few organizations have better information than hers – “ there are over 10,000 Russian soldiers fighting in Ukraine today." It’s important to understand just how important Melnikova and her organization are in the minds of the Russian people and, often grudgingly, to the Russian military. She is an active member of defense ministry's public council, and commanders knew perfectly well that no secrets can be hidden from Soldiers Mothers, since the organization has first-hand information about the army’s affairs. Melnikova's opinion has been respected by the Russian people since the days when the first zinc coffins flowed back to the Soviet Union along what came to be called “the river of the dead” from Afghanistan in the 1980s. Today, in an exclusive interview, Melnikova sounded absolutely furious. Russian experts wondered how far the Russian army would go in Ukraine. Kiev’s officials expressed concern that the Russian military will expand the southeast front all the way to the slender land-links to annexed Crimea. At present, Russia only has access to the strategic peninsula by sea or by air. But there remain about 500 kilometers (about 300 miles) left from Novoazovsk to Crimea, with the next major objective evidently the port of Mariupol, a Ukrainian stronghold about 50 kilometers down the road. Last week the Russian military already was present in the area of the land crossings at Armiansk and Chongar outside what Moscow officially declares as the Russian-Crimean border, and hundreds of cars waited in line for hours to have the Russian border patrol check the trunks and stamp the travelers' documents. But Ukraine does not recognize the border with Russia in Crimea and Ukrainian officials working on the other side of the Russian "border" did not have any stamps to let in foreign citizens traveling from Crimea. The atmosphere was tense, as locals worried the war would spill down from embattled Donetsk all the way to Russian-controlled Crimea. Russian servicemen outside freshly set-up border checkpoints claimed they had been deployed to "guard Crimea." A 20-year-old soldier patrolling the road outside of Armiansk a week ago told The Daily Beast that "so far my unit has not received any commands to attack Ukrainians in Mariupol," 400 kilometers away, but that seemed to be a possibility. For the last few weeks Melnikova's office has been getting information from alert mothers who had lost contact with their sons, draftees serving in the southern Russian region of Rostov. Many relatives, fearing the loss of their sons and husbands, are determined to travel from Kastroma, Ivanovo, Nizhny Novgorod, Pskov and other Russian regions deep in the motherland to Ukraine to look for their boys, Melnikova said, "the way relatives previously looked for their children in Afghanistan, Karabakh and Chechnya." “According to our expert analyses there are over 10,000 Russian soldiers fighting in Ukraine today." Over the weekend, Ukrainian security services arrested several Russian 98th Airborne Division servicemen from Kastroma. Their mothers planned a street protest on Thursday at 2:00 p.m. local time but officials banned the Kastroma press from covering the protest. Meanwhile one more Russian draftee, Petr Khokhlov, a serviceman from the 9th Motor Rifle brigade, was captured in the contested Luhansk region of Ukraine. In a video released by Ukrainian officials, Khokhlov named every commander of his brigade ordering him and other soldiers to remove the plates on their 14 armored personnel carriers and drive across the Ukrainian border. Yet, still, the Kremlin will not admit the truth about invading Ukraine, while separatist leaders offer increasingly implausible explanations. Alexander Zakharchenko, prime minister of the self-declared Donetsk People’s Republic, told Russian TV that 3,000 to 4,000 Russian citizens were fighting alongside his forces, but that they were former soldiers or active duty troops on leave. He insisted that they are all volunteers. Russian public opinion, in fact, does not support the idea of invasion: the latest polls by the Moscow Public Opinion Foundation showed that only 5 per cent of Russians want the regular army to fight in Ukraine. But not many Russian citizens are ready to demonstrate against the war. On Thursday there was only one anti-war protester in Moscow. As Yevgeniya Chirikova, a popular opposition leader, told The Daily Beast, "most leaders organizing anti-Putin protests are under arrests already; today one of my movement's activists Dmitry Monakhov went out to the Kremlin's walls to demand Putin stop his war in Ukraine. Police violently grabbed him and now Monakhov is facing a psychiatric examination. Any anti-war protester could either end up behind bars or in a psychiatric clinic, " Chirkova said. Truly, and tragically, this not-so-secret war between Russia and Ukraine is getting crazier all the time.